It’s November 23rd, Amazon is listing that new TV you’ve had your eye on with a 50% Black Friday discount. Everything looks great, so you take the plunge and bag yourself a nice new 50-inch plasma. It’s the best time to buy, right? Maybe not. When researching Black Friday deals by looking at price history last year, our team came across an interesting trend. It all started with the Crock Pot. We noticed that the highest price of the year for the popular slow cooker was the day before Black Friday. But why would retailers do this? The answer is simple. It’s all about inflating the price in the lead up to Black Friday. When deals week arrives, retailers discount the product to create the illusion of a deal. It’s a shady tactic to generate sales, all the while maintaining profit margins. Sure, there was still a ‘discount’ on Black Friday, but it was heavily overstated. Since this revelation, our team began noticing this trend crop up across hundreds of different products in varied categories, ranging from WIFI routers to gun safes. Here are just a few with suspicious price history over the past year. One of the worst culprits are gaming hardware manufacturer Razer. In the run-up to Black Friday last year, we observed the Razer Blade Stealth Ultrabook price increased by $250 dollars. Only to be ‘discounted’ back down to its original price on Black Friday a few days later! 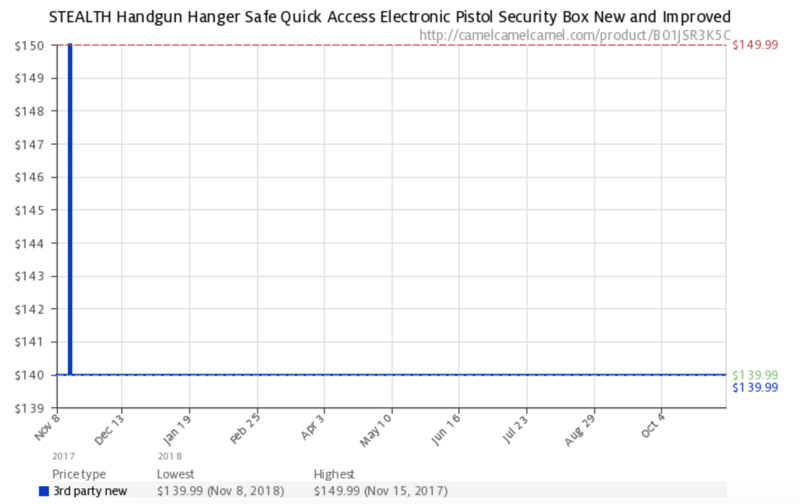 One of the clearest cases of Black Friday sale manipulation we came across was with the Stealth handgun safe. The product was retailing at $139.99 before being increased sporadically to $149.99 for a few days in the run-up, only to be dropped back down to the original price in a ‘Black Friday sale’. The hugely popular DNA testing kit AncestryDNA also shows some pretty questionable price movements. The kit was being sold around $80 from November 1st up until a few days before Black Friday, where it was increased about 25% to $100. It was then dropped to $70 in what would have looked like a 30% Black Friday deal. However, in reality, this was only a 10–12% discount off the original RRP. But it’s just smaller, less trustworthy brands doing this, no reputable company would engage in this sort of practice? Wrong again. The Google Home WIFI System is another product suffering from price manipulation. On November 22nd, 3 days before Black Friday, the 3 pack system was increased to one of the highest prices of the year. Yes, it is better than some others as there was still a hefty discount on Black Friday, but the point is consumers are being led to believe these sales are greater than they are. Despite the manipulation, some products still see the greatest discounts on Black Friday, so often, this is still the best time to buy. What this illustrates is the need to be wary when shopping for goods on Black Friday, Cyber Monday or any other sales day for that matter! Always check price history before making a purchase, otherwise, you risk falling for false discounts.